The term corpectomy is derived from the Latin wordscorpus (body) and -ectomy (removal). The procedure typically involves accessing the cervical spine through an anterior approach, or from the front. 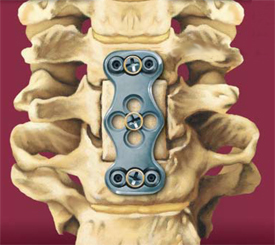 Spinal fusion is usually necessary because of the amount of vertebral bone and/or disc material that must be removed to achieve sufficient decompression of the neural structures. Spinal fusion involves placing bone graft or bone graft substitute between two or more affected vertebrae to promote bone growth between the vertebral bodies. The graft material acts as a binding medium and also helps maintain normal disc height – as the body heals, the vertebral bone and bone graft eventually grow together to join the vertebrae and stabilize the spine.